Since I am currently avoiding thinking about putting my naive, imaginative, little boy on a bus for an hour and a half every day, I got thinking about all the things I LOVE about summer. The list is really too long and boring for a blog, but then I got thinking "products!" The stuff that makes summer flow easily around here. The stuff that I get NO MONEY or stuff for endorsing here on my blog with seven readers, but whose awesomeness makes me want to bore you tell you about anyway. Water Shoes. Also known as aquasocks. LOVE them. The boys can go from sand to water to germ-infested playpark when we are at the lake and be comfortable at all three. We also use them at wading pool, creeks and splash pads. Plus, they are cheap like borscht. I get mine at Joe (in Superstore) and they really are the best seven bucks I spend all summer. Coopertone Kids Spray-on Sunscreen This has CHANGED OUR LIVES when it comes to sun protection. It is easy-peasy and it works really well. Sprout is a very very pale little thing with almost platinum blond hair. He is the poster child for potentially bad burns. He hasn't even gotten pink. And we LIVE outside all summer (well, when it's not pretending to be winter around here). It is not cheap, but coupons come out in late spring and it seems to be marked down a fair bit at Walmart in May and June. To this cheap-o it is worth every penny. Opi Nail Polish I have taken to giving myself pedicures after being given a bottle of this stuff. I am the world's biggest klutz and this stuff is perfect for me. It flakes off skin easily, (Yes, this is important, I tend to drip) goes on smoothly and lasts for a long time, long time. I've always used the cheap drugstore stuff but I am converted this summer. Dripless Ice Pops These are super easy to make, quite healthy and completely mess free. No nasty freezies for us and should someone hypothetically leave one lying on the deck for three hours, it will retain it's shape, just not it's tastiness. Hypothetically. Contigo Water Bottles These are fantastic. They do NOT leak. At all. No matter what you do. Mayhem and Havoc have certainly tried. We've used them all summer and we've saved a ton of plastic bottles and juice boxes. Also hypothetically, if your children are given to biting things, the rubber coating on the bottom does not stand up to repeated gnawing. Hypothetically. So, how about you? What could you not make it through the summer without? An actual phone conversation with my husband. WC: Oh I am sorry, I wasn't able to dig out those papers you wanted. I got talking to G about stocks. For two hours. It was awesome. But then I had to go to work. HG: That's OK, I'll just get them. Where are they? WC: I think they are downstairs. Or maybe upstairs by the phone. They might be in the van. Oh, I'm not sure that they are in the van. Maybe they are in the car. (The one he had at work.) There's all kinds of places they might be. I'm not exactly sure. HG: (While beating head against wall) Hey sweetheart, I'll just let you find them tomorrow. So Auntie V, the papers will be in the mail as soon as Way Cooler checks all the places they might be. My brother's wife is one of my favorite people. She is also the polar opposite of me. Thin, totally into fashion and her house is always perfect. Polar opposite. She's also a wee bit technologically challenged. So, her geeky sister in law has been happily introducing her to new ways to spend my brother's money websites she may not yet be aware of. First it was Etsy. Then Kelly's Korner (she and Kelly have daughters two weeks apart and identical taste in clothing, so she has bought several outfits that Kelly puts on Harper) and today I told her about Groupon. This is payback for all the times my brother locked me out of the house in the snow. If you don't know about Groupon, and you live in or near a major city you really need to check it out. There are some really awesome deals. Awesome. Cheap shopping from the comfort of home. LOVE it. My lack of blogging recently has generated some questions from some of you. I am fine. I just still have limited energy (apparently it can take six months to a year to fully recover from surgery this major, yee haw) and am choosing at this moment to spend my energy on two small boys with crewcuts, one of whom starts grade one in 14 sleeps. No, I do not want to talk about how soon school starts. Thanks for asking. While I do really dislike the distance my son must travel to school, there are lots of things to love about schools here. My son's school does not assign homework in grades 1-3 other than home reading. Which we do anyway. Wa-hooo. AND there is a really reasonable supply fee we all pay but then we don't have to buy any school supplies. No elbowing other moms for 15 cent glue sticks at Staples, no labeling of kleenex boxes, we just supply the backpack and lunch kit. It's LOVELY. So, I think I can forgive the nutty bussing system as long as they keep buying my pencils and allowing my kid to enjoy his afternoons instead of being forced to do worksheets at home. While on vacation this summer I tried fish tacos for the first time. OH THE DELICIOUSNESS. I've seen a bazillion recipes online for these, but it's hard to know which ones are good and with Way Cooler if I introduce a new food, it CANNOT fail the first time or the experience will scar him from ever trying it again. So, does anyone have a fish taco recipe that rocks your family's world? 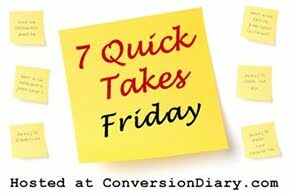 For more quick takes, please visit the lovely Jennifer at Conversion Diary. After spending my spring being freaked out about my surgery and then recovering from my surgery I am trying to cram in as much of summer as I can. Unfortunately I can never think of anything to write about after all the funning*. So, I was delighted to be tagged by the ever-lovely Nicole, who blogs at Girl In a Boy House. We have recently discovered we live quite close to one another and our boys play together REALLY well. It's awesome. As is having something to blog about. What experience has shaped you the most and why? I would have to say being born into a household of faith. My faith was introduced to me at a very early age and it has set the course for most of my life. I know I would be quite a different person if I had been raised with a different belief set. if you had a whole day with no commitment what would you do? That just described the entire second half of May. And it really kind of sucked. Now mind you, I was recovering from having my rib cage cracked open and was on all kinds of narcotics so that may have something to do with my ambivalence, but I have discovered I do LOVE being productive. This may also have something to do with my upbringing. Oh heavens. Do not ask a pseudo-foodie this question. Now I am hungry thinking about all my favorite things. Chocolate and cheese spring to mind but so does asparagus, steak and a Tim Horton's Iced Capp. I am also rather partial to popcorn, sweet peppers, butter, fresh bread and sour cream. And now I will stop. Ever since reading Heidi in the second grade I have had a desire to see Switzerland. Because we are both so tight the closest I'll ever get is a travel film, but still, I'd love to see the Alps for myself. I am really a lousy girl in the aspect. My friends will discuss some "hot" actor and I am usually all "meh". Seriously. Matthew McConaughey. Meh. George Clooney. Double meh. Justin Beiber? Ew. I'm old enough to be his MOTHER. I love my husband and think he is a hottie, but beyond that, there aren't many that I might want for my imaginary boyfriend. Which I guess is a good thing. If you were the leader of the country what would you do? Move us all about 500 miles south. Sweet tea and socialized medicine. Now that's perfection. Give me one savoury recipe that doesn't include cheese. Hummus. Tzatziki. Baba Ganoush. Now I seriously need a pita. A teacher. So I became a teacher. It may have been a childhood dream but it was not a dream come true. When I go back to work I will be doing anything but teaching. It's a LONG story. If you could spend just one day in the body of someone else who would it be? Anyone over 5'5". Id like to be able to reach my top cupboards without jumping on the counters at least once in my life. What character trait inspires you the most? People who are easy going and not quickly ruffled. The complete opposite of me. Thank-you Nicole for the brain-wave. We now return you to your regularly scheduled summer funning. *I am aware that funning is not a word. It really ought to be.